MOTUL and Dorna WSBK Organization are delighted to announce that the championship partner will become the event main sponsor for two of the biggest weekends on the 2019 calendar, the MOTUL Dutch Round that will be hosted from 12th-14th April, and the MOTUL Argentinean Round that will take place from 11th- 13th October. The fourth round of the season will be rolling into the iconic TT Circuit Assen, a place that always provides thrilling racing action, and classic WorldSBK races. 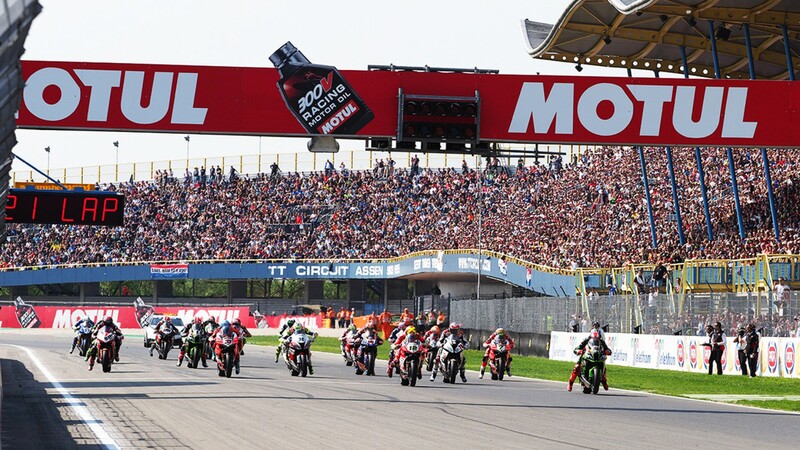 With the Dutch crowd filling the grandstands to support their local hero Michael van Der Mark (Pata Yamaha WorldSBK Team) fighting for the WorldSBK title, the MOTUL Dutch Round will see an atmosphere of pure racing passion. But it’s not only the stunning on-track action that will make the MOTUL Dutch Round an event not to miss, as fans will also continue to be treated to an incredible experience off-track, thanks to the extra support from the French company in the various fan zones. Bringing the MOTUL FIM Superbike World Championship even closer to the fans, the world-famous Paddock Show will hold a live stream during the weekend offering live interactions with riders and the Paddock Show host, and in addition a MOTUL Superfan will be treated to an unforgettable WorldSBK experience “behind the scene” of the most popular production-based motorcycle racing series. On top of that, MOTUL will continue to offer fans a pure WorldSBK experience to all fans attending the event track-side in Europe as a special cart will be present in the European paddocks contributing to bring even more entertainment. Leader in the production of high-performance motor oils and industrial lubricants for more than 160 years, the French company has a long history in motorsports, and apart from offering their stunning hospitality, they will make their long-lasting experience in the racing world available for all fans. Thanks to their special MOTUL MC Care cart, and within the commercial area, fans will be able to test the incredible benefits of the MOTUL MC Care products, a high-quality range designed to provide the most attentive treatment, on their helmets and leather jackets. Exciting games will give the chance to win exclusive prizes such as helmets, paddock passes and even access to the starting grid, and all the winners will be awarded on the Paddock Show stage. Expanding their support in the WorldSBK Championship, MOTUL will also continue their partnership for the Argentinean Round. Heading into the 12th round of the season it will be a crucial round for all riders as the championship wins could be seen in South America. With the stunning background of the Andes and the Argentinean landscape, Circuito San Juan El Villicum will be the perfect stage for incredible WorldSBK races. Fans will be able to enjoy another exciting weekend, supporting their local star Leandro Mercado (Orelac Racing VerdNatura), who will give all that he can to succeed in front of his home crowd. Fabrizio D’Ottavi, Motul Group Powersports Communication Manager: “Motul considers the Championship an ideal environment to carry out business on both B2C and B2B levels.